WOW 2019 is confirmed for May 30th-June 2nd. We have all 5 sites. Registration will open February 2019. On-site registration is open as long as space is available. Limit is 120 attendees. Click here to download the 2019 WOW Registration Form. 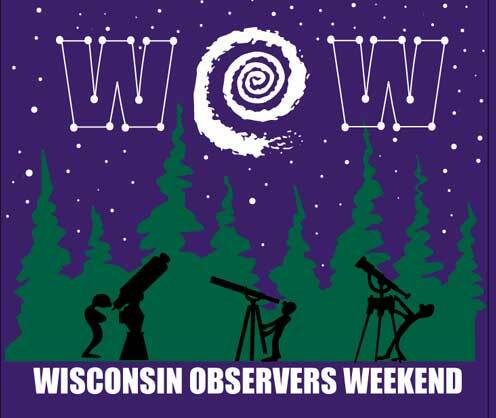 One of the biggest highlights of the year for amateur astronomers and their families is the Wisconsin Observers Weekend (WOW), hosted by NEWSTAR. Amateur astronomers from all over the mid-west enjoy three days of summer camping and observing at Hartman Creek State Park just west of Waupaca Wisconsin. Whether or not you own a telescope or are a seasoned observer you will enjoy what WOW has to offer. Hartman Creek State Park is 1,500 acres of post-glacial beauty located about 30 miles northwest of Oshkosh on the upper Waupaca Chain-O-Lakes. Visitors can enjoy camping swimming, hiking, biking, picnicking, and fishing, amidst the gently rolling woodlands, prairies, lakes and wetlands. Ten miles of hiking trails, including a segment of the National Scenic Ice Age Trail, offer plenty of opportunity to stretch your legs while enjoying numerous wildflowers and abundant bird life. The park also has designated off-road bicycling trails and low-traffic roads surrounding the area provide safe routes for the touring cyclist as well. Hartman Lake has a 300-foot sandy beach and swimming area for a cool dip after a hot day. WOW reserves all five-group campsites at Hartman Creek State Park so that your evening observing environment is white light free and as dark as possible for your enjoyment. This is primitive camping – pit toilets and hand water pump only – but hot showers and “flushes” are available in the family campground a short distance down the road. Tent camping sites are plentiful, however there is no parking on the grassy areas, so recreational vehicles or campers may find space tight in the limited parking areas. Saturday afternoon NEWSTAR hosts an ice cream social for WOW attendees free of charge. Drawing for door prizes will be held at the same time. Just down the road, the town of Waupaca has all the conveniences and amenities you might need, and hotels are nearby if you do not wish to camp. Although it’s only approximately 5 miles away, light pollution from Waupaca has very little impact on Hartman Creek State Park. NEWSTAR registration fee includes your WOW registration and camping fee. Registration is limited to 120 attendees. You must purchase a Wisconsin state park sticker or daily pass to enter the park (Resident/non-resident, $28/$38 annual sticker, $8/$11 daily pass). We hope to see you under the stars at WOW 2019.